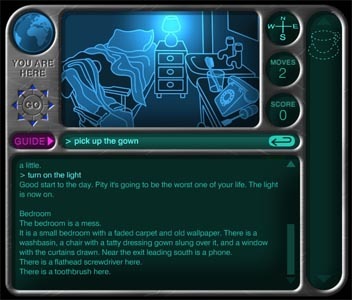 Steve writes: In 2004, for the 20th anniversary of The Hitchhiker's Guide to the Galaxy game, which I co-authored with Douglas Adams, the BBC produced an updated version of the game. Unlike the original, the 20th anniversary edition would be playable online, at the BBC's website. The British Acadamy of Film and Television Arts (BAFTA) award is Britain's equivalent of the Oscar. In addition to presenting awards for film and television, BAFTAs are also given for interactive media. 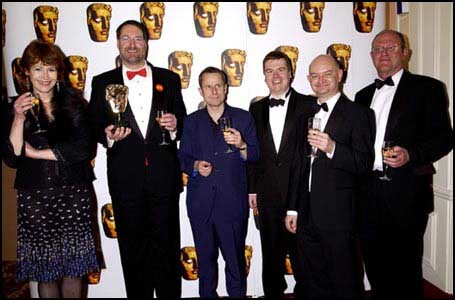 In 2005, The Hitchhiker's Guide to the Galaxy was nominated for a BAFTA for Online Entertainment. As guest of the BBC, I flew to London for the ceremony, which was held on March 1. It was a black tie affair, and the champagne flowed like ... well, like champagne at a black tie affair. Finally, the envelope was opened ... and Hitchiker's won! Below, at the reception following the awards ceremony are (from left to right) Douglas' widow Jane Belson, me, a British comic who hosted the ceremony, Sean Solle who programmed the C++ engine that allowed the game to run on the BBC's website, Roger Philbrick who produced the anniversary edition for the BBC, and Rod Lord. With such a large team, though, the issue arose of what to do with our sole statuette? It was decided that we'd each hang on to it for a while, and that it would ultimately go to Douglas' widow, Jane. And with members of the team in three different countries, it would be quite a journey for the BAFTA. I took it for the first leg of that World Tour. I had it in my backpack going through security at Heathrow airport, and I got called aside for a hand-search of my bag. As the security worker pulled each item out of the bag, he placed some to the side, but others he placed in one of those gray plastic trays, explaining apologetically that he'd have to run them through the belt again. Finally, he got the the BAFTA (which is quite hefty, by the way) and lifted it out. He looked at it quizzically, and then asked, "Is this an Oscar?" When I replied that it was a BAFTA, he sort of hit himself on the head as if to say, "Duh!" Then, when it was being run through the belt again, the woman reading the x-ray screen said, "Oh, look! A BAFTA!" and called the other security workers over to see it. 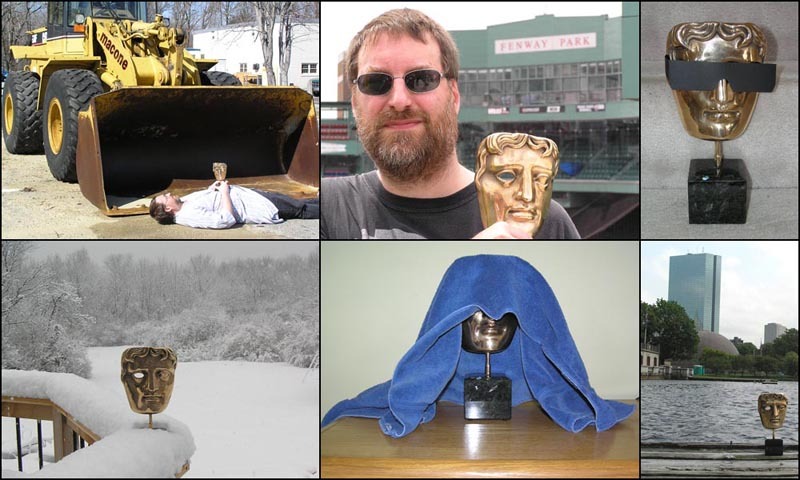 Below are some photos of the BAFTA during the U.S. leg of its World Tour. Top row (left to right): lying down in front of a bulldozer (wearing a bathrobe, of course); atop the Green Monster at Fenway Park; wearing peril-sensitive sunglasses. Bottom row: braving a New England winter; wearing its towel like a real hoopy frood; on the shore of the Charles River in downtown Boston. The Fenway Park photo, taken during an off-season tour, is a particular favorite ... as my pal Dave Rohrl was snapping this shot, the tour guide asked, "Is this some sort of garden gnome thing?" Last updated: 4-10-08. Contact boffo@boffo.us.